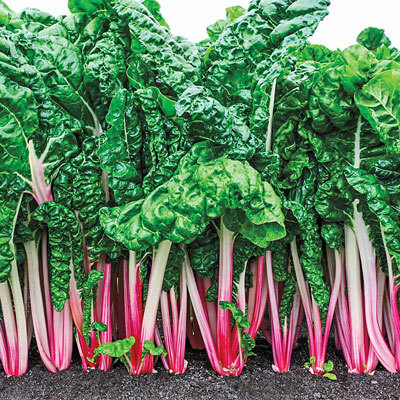 Peppermint Chard | Henry Field's Seed & Nursery Co.
Looks As Good As It Tastes! Unique peppermint striping and gorgeous, glossy, dark green leaves makes this chard a standout novelty in the vegetable garden. But excellent flavor and heat and bolt tolerance will make it a favorite for years to come! 55 DAYS. For each offer ordered, get approx. 100 seeds per pkt. Spacing: 6 inches apart in rows 18 - 30 inches apart. Depth: 1/4 - 1/2 inches. Foliage: Stems are white with stripes of pink on the back and have bright pink margins on the front, leaves are glossy, wrinkled and dark green. Soil Requirements: Moist, well-drained soil.